On Target: How the World's Hottest Retailer Hit a Bull's Eye by Laura Rowley investigates the history and popularity behind how Target became a retailing sensation while taking the discount juggernaut Wal-Mart. The book is a decent read but hardly an outstanding recount of Target's history from department store to 1,300 plus store retail chain. The problem with the book, ironically, is right at the beginning where traditionally authors tend to hook the reader. In this particular book Rowley starts off writing about how great target is in terms of how Target competes on price, design, welcoming environment and being good corporate citizens. Except, she spends five plus chapters, 82 pages, telling readers what Target today is all about. Then, on page 83 the rewind occurs and the reader is taken back to start the history of Target from George Draper Dayton onwards. The rest of the book takes the reader from George's founding of what would become Target up until the early 2000s and the challenges Target faces. The main issue about the book is it is not written in chronological order and makes a great jump. Perhaps the book could have been reordered so that the introduction gives the reader a snapshot of what Target is today. This introduction could be five to ten pages at most. Next in Chapter one it would start off by saying "to actually understand Target's success and corporate values one must start at the beginning and watch the company evolve." This would then lead the reader from back of George Draper Dayton's era to the issues Target is facing today and then forcast into the future how target could be a success. The book overall - once the excitement about how the Target is a great designer, marketer, clean and philantropic is ingrained into the reader in the first five chapters - is a fantastic read. The book investigates how George Draper Dayton moved into retailing industry via founding a department store in Minnesota. From there, Bowley takes us through how the return policies, corporate values, company was passed down through the Dayton family and the possible hostile takeover was thwarted. 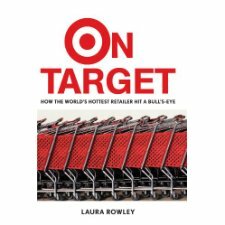 While chronologically moving through the history of Target, author Laura Rowley, brings in current and ex Target executives and management to provide insight into how things were at the time. As well, she brings forth ample amount of research noted in over 8 pages of endnotes. The only downfall with her research is the failure to provide a full Bibliography of her sources at all. The insight the reader has that Laura Rowley actually did any reasearch is her end notes. However, a complete list of sources at the end would have made her research stand out even more. Without the Bibliography, one wonders how in depth the research actually was in terms of reading the current availbility of books, newspaper articles, in depth interviews and much more was. The only indication at all about the depth of research is mainly evidenced in the content of the book with direct quotes from company and industry executives as well as, again, the end notes. But the Bibliogpraphy references would have further reinforced the author's authority on Target company history. Overall, those wondering how Target as a company came to be a leading American, and soon to be Canadian retailer, should read Laura Rowley's book as it delves into the company history quite nicely. However, the reader should be warned this book does have it's drawbacks that need to be duly noted.